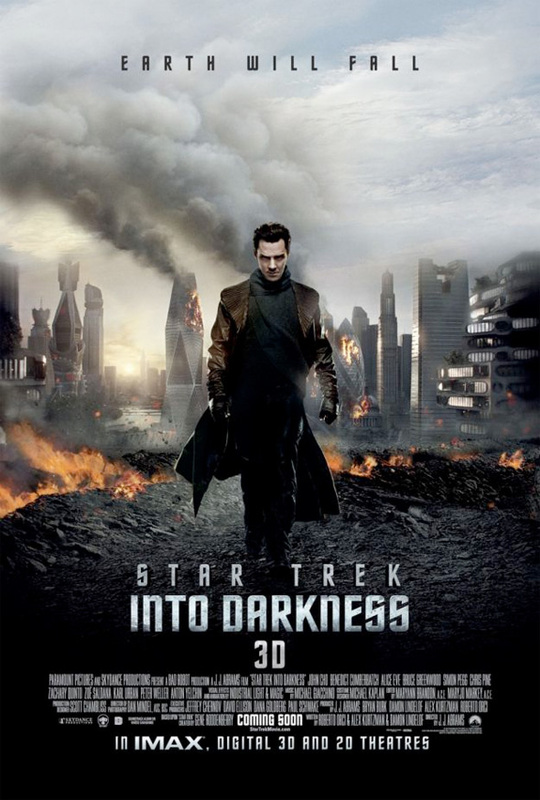 It's pretty clear that the marketing team behind Star Trek Into Darkness is really painting a picture that this sequel is like The Dark Knight from director J.J. Abrams. From the first teaser poster with Benedict Cumberbatch and the Starfleet logo formed from debris to the trailer giving the villain plenty of screentime, there's no denying that John Harrison is bringing the same chaos to space that The Joker brought to Gotham City. Now a new international poster continues the similarities with another poster featuring the villain and his terrorism. It's a bit like this The Dark Knight poster. But it's still pretty cool. I feel like Jay-Z's "Dirt Off Your Shoulder" should be playing. By the looks of how many hints they are giving in movies.......London seems like a place that will fall!! Very true, but at least they haven't shown anything as blatant as London being completely destroy like they did for G.I. Joe: Retaliation. I love this...I'm a big fan of star trek, but the feel of the poster and trailers makes it seem like this is not a star trek movie. Which is why I bet this movie is gonna be a real crowd pleaser! if the star trek movie will be a crowd pleaser the earth will really fall..
You can see the same rising column of smoke in the background, repeated not less than two times, right next to each other. How come that gets under everyone's "Bad Photoshop!" radar? This is dreadful.